A true story inspires the moving tale of a mule that played a key role in the civil rights movement— and a young boy who sees history anew. Sitting on a bench waiting for his mother, Alex spies a mule chomping on greens in someone’s garden, and he can’t help but ask about it. ""Ol Belle?” says Miz Pettway next to him. “She can have all the collards she wants. 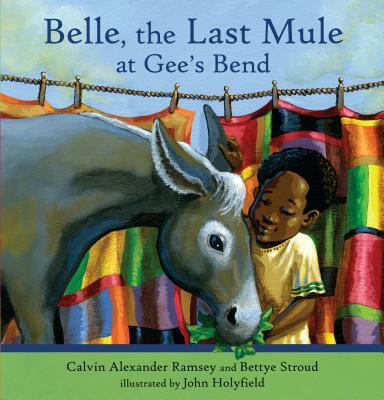 She’s earned it.” And so begins the tale of a simple mule in Gee’s Bend, Alabama, who played a singular part in the civil rights movement of the 1960s. When African-Americans in a poor community— inspired by a visit from Dr. Martin Luther King, Jr.— defied local authorities who were trying to stop them from registering to vote, many got around a long detour on mule-drawn wagons. Later, after Dr. King’s assassination, two mules from Gee’s Bend pulled the farm wagon bearing his casket through the streets of Atlanta. As Alex looks into the eyes of gentle Belle, he begins to understand a powerful time in history in a very personal way. Calvin Alexander Ramsey is a playwright, photographer, and painter. He adapted one of his plays for print as RUTH AND THE GREEN BOOK, illustrated by Floyd Cooper. Calvin Alexander Ramsey lives in Atlanta. John Holyfield has illustrated several books for children, including THE HALLELUJAH FLIGHT by Phil Bildner. John Holyfield lives in Virginia. An intergenerational story filled with heart and soul. Lovely to look at, informative, infinitely readable. The kind of book you can simply enjoy reading and having on your shelf.